This picture was too cute not to use. So I turned it into a story starter for spring. 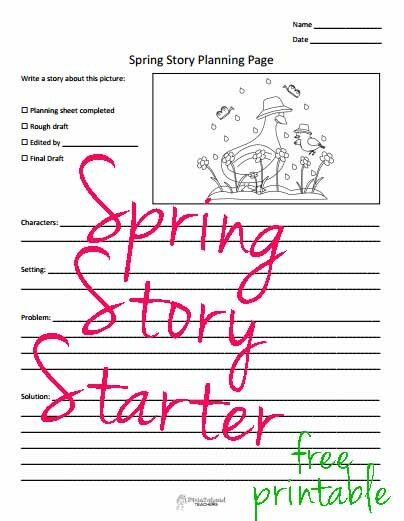 Have your students review the parts of a story and then plan each part of their story (using the attached planning page) before they get to work on any of their drafts. Once they’ve had a peer edit it, and they’ve written their final draft, they can color the large version of the picture and display it with their final piece. Super fun, and super cute. What’s not to love!? Don’t forget to check back later this week for my first giveaway! This entry was posted in Holidays/Seasons, Language Arts, Spring/Easter, Writing, Writing Prompts and tagged Children, Easter, Education, Elementary School, Kids, spring, story, story starter, Teacher Resources, Teachers, Teaching, Writing, writing prompt by Squarehead Teachers. Bookmark the permalink.